NIKO is my lifetime partner and my level horse. 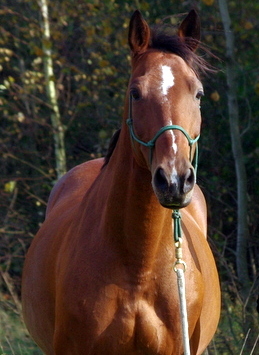 He is a bay gelding of Polish breed called Małopolska, which was developed in the 19th century from Polish native horses crossed with Thoroughbreds and Arabians. Niko is 20 years old now, but I've known him since he was a yearling. My parents bought him for me when he was a 3-year-old stallion. At first, I just wanted to hack him out and have fun. However, hacking out is not much fun when your horse rears, bucks and you cannot stop him. Luckily this is when I found Parelli, gelded Niko, and started attending annual Parelli clinics held in Poland, making our way step by step to level 4. If not for Niko, I would never have been where I am now. He has taught me a lot and he still is teaching me something every day. He is a clever, athletic, high-spirited horse, born as a Right Brain Extrovert (spooky and keen on moving his feet) but now he is more often a Left Brain Introvert (confident and calm). I truly believe you find a horse like him once in a lifetime.